One thing that hasn't changed over the years is the love for mehndi ! 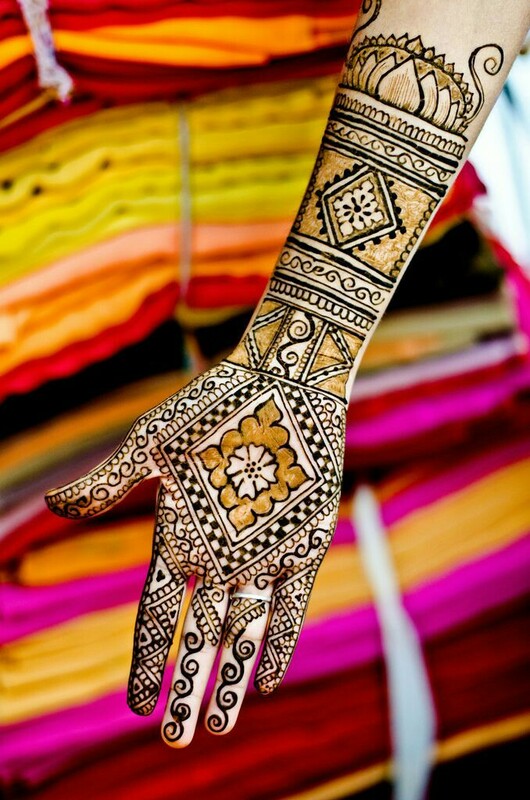 Women from ancient time to women of 21st century are all crazy about beautiful henna mehandi patterns. Mehndi can take your look to another level, this beautiful thing when drawn on hands and feet enhance your beauty a lot more than you could have imagined. What happens when creative fashion minded people take up the art of mehndi? It leads to the birth of new techniques ! Well the outcome is fabulous creations which would look stunning on your hands and feet ! One such technique to have become a HIT with mehndi lovers is 'Shaded mehndi'. When it comes to mehndi there is no difference in culture or traditions, its universal and loved by one and all. With shaded mehndi the creativity is unlimited. You can try a different color for shading and a different one for outlining, you can go light handed or heavy handed in shading the inner portions of a floral motif and much more. This technique is quite a trend nowadays among popular mehndi tatoo artists who give their customers a royal unique design every single time. There is no doubt that shaded mehndi design looks incredible . The graded hues look beautiful and make for a sweet printed effect ! 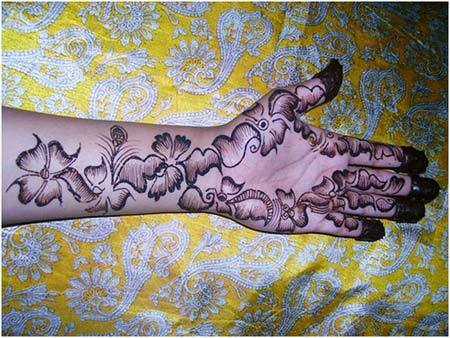 Below are our top -- picks from the latest mehndi henna designs which when done correctly will make you a shading expert ! These mehndi designs are sure to add beauty and life to your hands and feet ! 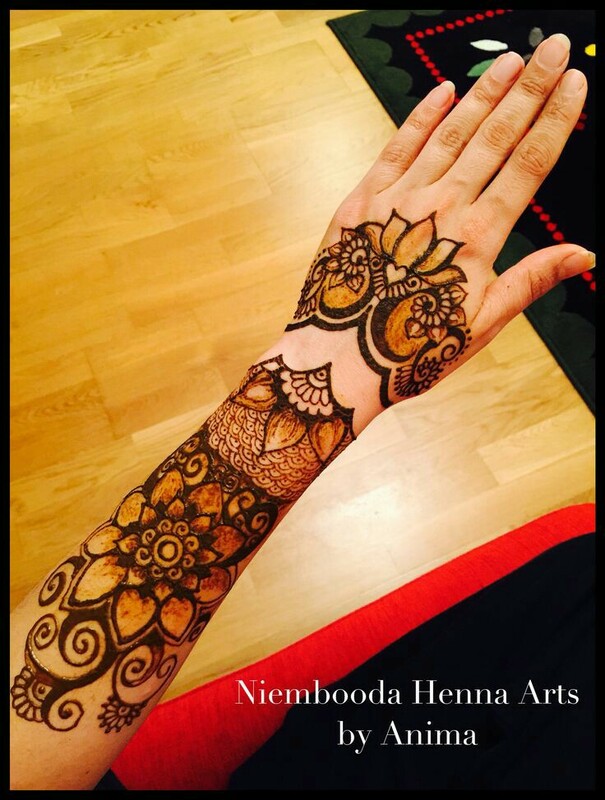 A contemporary take on traditional mehndi art, the Moroccan mehndi design with light creative shading in specific areas makes it the most exquisite henna pattern with shading! 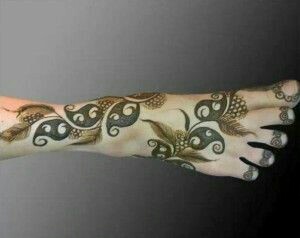 This mehndi design has Small detailing all over the palm extending to the elbow and has a lot of Moroccan mehndi art vibes to it. 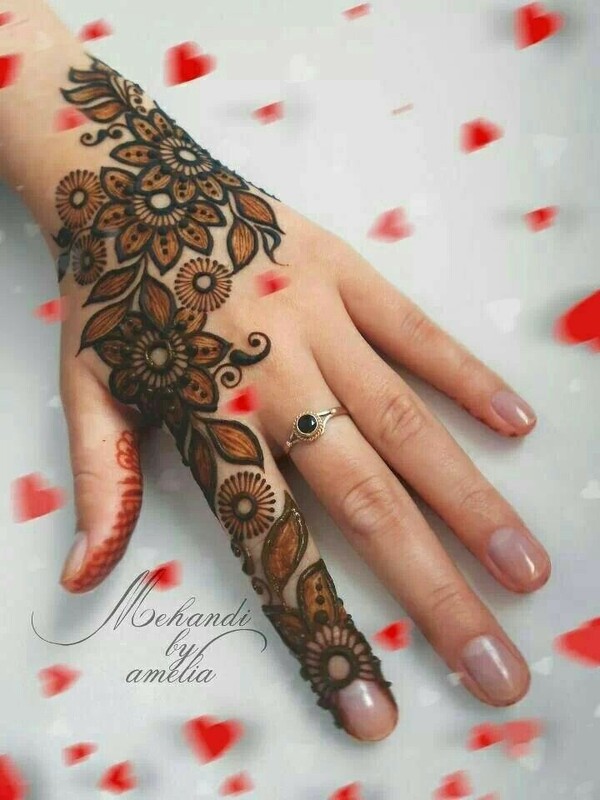 I love the fact that the minutely detailed patterns cover all of the hand and the arm making it a beautiful choice for brides this summer.Absolutely love this latest mehndi design ! This is one of my personal favorites among all the latest shaded mehndi designs. It has thick outlining which adds to the whole beauty of the pattern. This one is not going to take much time to draw on your hands as it only requires thick borders and inner shading to complete the beautiful pattern. It will look absolutely gorgeous on all types of skin color and sizes. Perfect for a festive occasion or probably your engagement. This floral extravaganza tops our list of the latest mehndi designs for 2017! This beautiful bridal design has cute little hearts at the bottom of the floral motifs and look amazing when done correctly. This might need a little practicing. 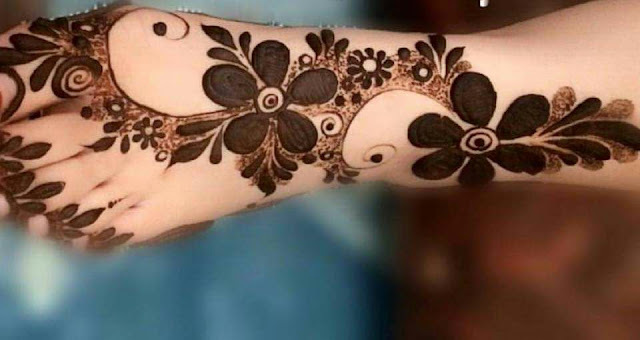 This particular mehndi design has a lot detailing going on and the flowers are highlighted with light handed shading. The paisleys springing out from the flowers adds to the dimension of the design and make it look more attractive. An edgy bride who wants to differ from all the others can go for this for this the most UNIQUE lotus patterned mehndi design. With India having lotus as the national flower this sure is a beautiful design to be drawn on the occasion of Independence day or Republic day celebrating freedom. The mehndi design has a jali in the middle through which the lotus creeper is drawn in an upward direction. One word. Gorgeous ! Mus must try for this wedding season 2017 also ! One of the most beautiful mehndi designs among the best latest mehndi designs out there. Hands might be the first thing everybody looks at but pretty feet is also an added bonus ! This beautiful half shaded half filled mehndi designs have beautiful flowers filled with mehndi which are very prominent and it is further enhanced by shading along the flowers and the pattern. 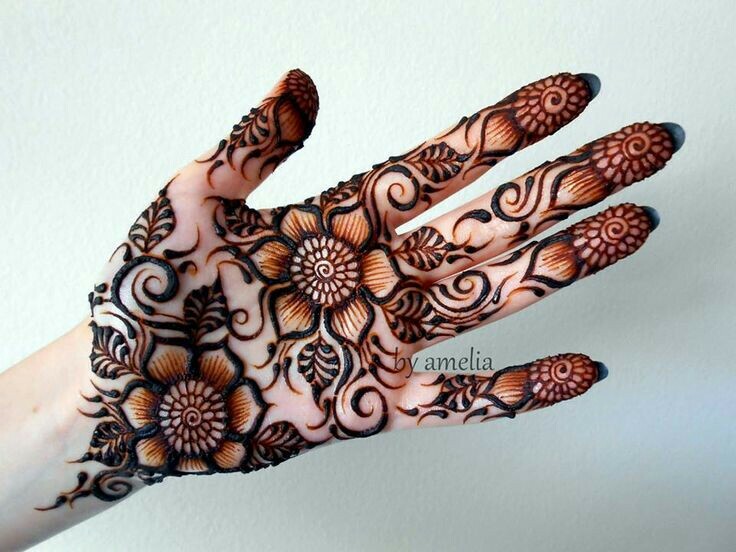 This latest mehndi design has least shading highlights which makes it even more beautiful. 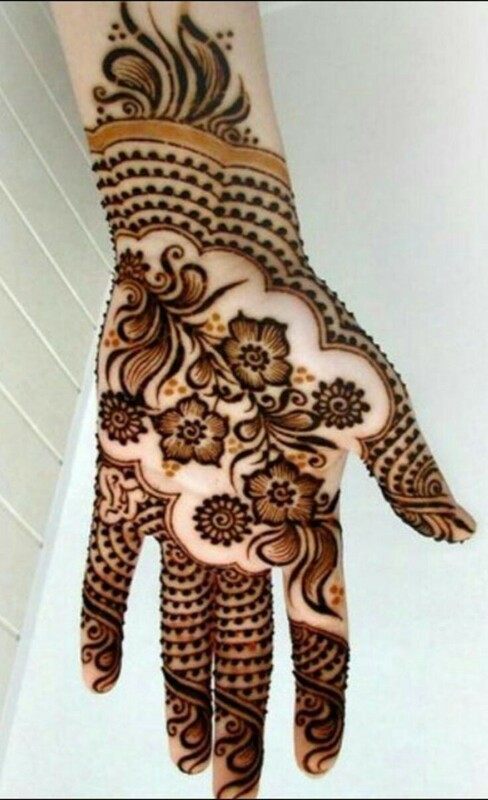 This henna pattern will look absolutely stunning on Asian women . The pattern is dominated by leaves with a few flowers to bind them. This design is one of a kind and perfect for bride's to be and guests attendance in a wedding! I remember we had mehndi competition in College most of the competitors opted for this pattern. It was a huge hit among young women which comes as no surprise for it looks gorgeous once the henna is removed . The stain left looks lovely and picturesque ! 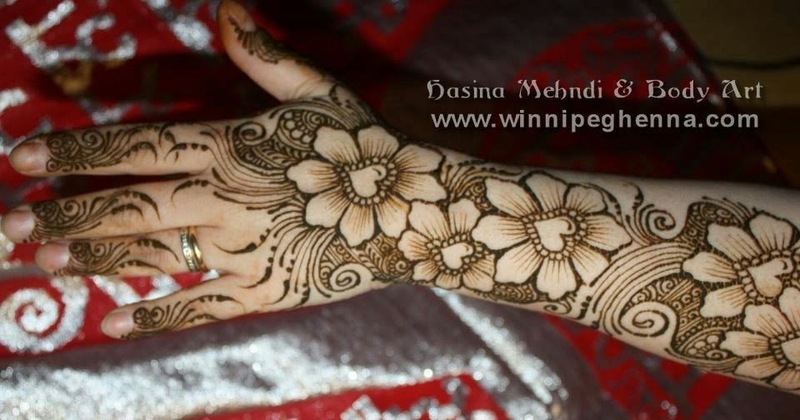 The henna pattern has flower petals and loads and loads of leaves connecting to one another. These motifs are filled with a shading technique where you place the a thicker dot at the start and shade along in a thin line. This latest mehndi design will surely make you center of attraction. 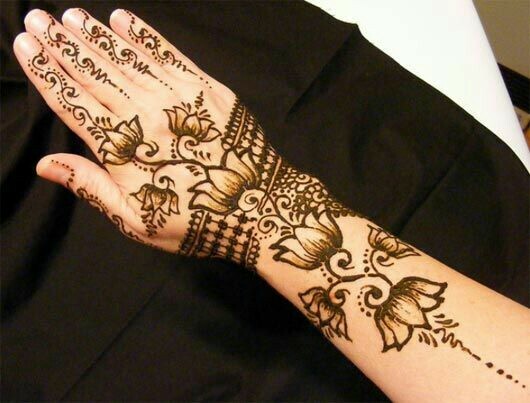 This type of henna pattern requires two types henna mehndi cones. 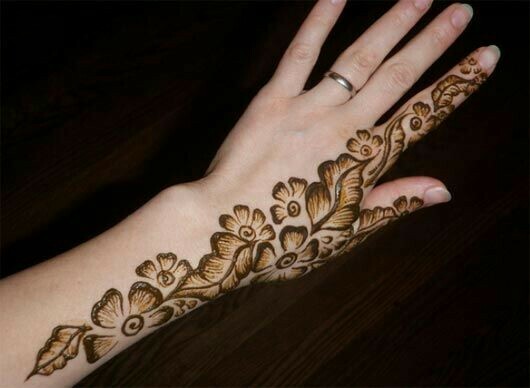 The first henna mehendi cone should have a thick hole so thick lines can be drawn. 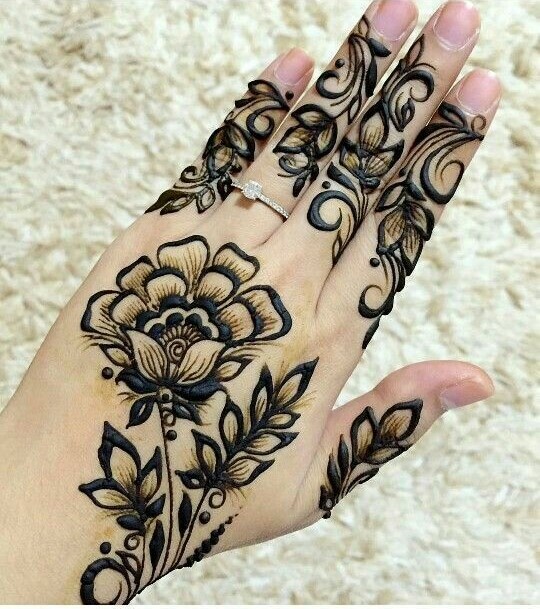 The outlining of the pattern is beautiful done with a thick outlined black henna and the inner most portion is filled with shading done from a thinner holed mehndi cone for maximum effect. The flowers in this latest mehndi design are adjoined to one another with leaves springing out to enhance the beauty of the henna pattern. the shading here is one the simpler side. this would look lovely on the palms of young little girls. The mehndi design here has moderately sized floral patterns which are covered with small detailed pasterns all over. As Young little girls like their names written this one is perfect for them. Just get their name written on the little finger and they are good to go ! One of the best latest mehndi design for kids,. Those who are afraid of inking , mehndi is a great option for them . 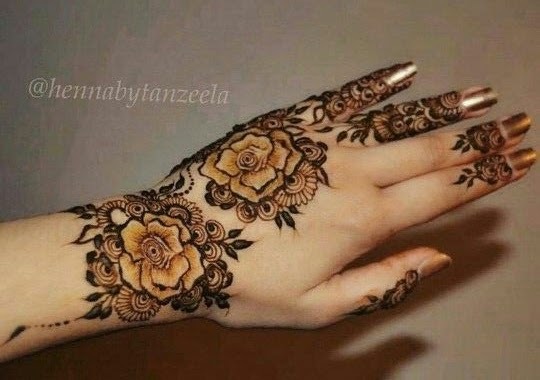 This lovely latest mehndi design which has a lot of bare spaces and beautiful roses with shaded details in the inner parts of roses makes it chic and modern . If you are the one who shy's away from bold patterns go for this sweet mehndi pattern! Thick borders is instant glam ! These floral motif pattern might seem a simple one but it goes well with all most all western and Indian wear ! This latest mehndi design will suit all kinds of palms and give that ultra chic look! This is a great design for beginners and has small floral and leaf motifs in the arabic mehndi style. Best suited for a simple occasion they are sure to make your hands look beautiful without having to put in much effort ! This latest mehndi design can be achieved within minutes ! The matka or the Matki is quite popular in India as most of us still use this earthen pots to cool water naturally. The finger tips have loads of color as they are heavily filled while the earthen posts have decorated motifs as if they are painted and to give that painted effect , the use of shading is a clever one ! If I were to choose the most 'Hatke' Mehndi design from the latest mehndi designs it would probably be this particular mehndi design. These beautiful decorated matka's make for a change when brought in the form of a mehndi art ! Its different and mind blowing! Agree? feathered patterns with paisleys springing out from a creeper is LOVE ! This beautiful henna feather mehndi design will steal your heart and make you the center of attraction at any occasion ! Feather henna patterns are the ones which make this design stand out as the feather henna is done with very careful shaded strokes! The paisleys are hence filled totally to intensify this henna feather pattern. If you are on an outlook for latest mehndi designs to try this year then this is what you must opt for ! You might have seen thick bordered colorful flowers with leaves as a print in many Sabyasachi lehengas and sarees but have you seen such a pattern on the back of the hands? It gives a perfect tattooed look ! I had mostly seen this beautiful latest mehndi design right here on floral bed sheets and floral maxi's but was surprised to see the beauty of it on the back of the hands ! It is a beautiful mehndi for office goers as this does not extend till the elbow and is less on the glam factor and high on the elegance factor! A peacock motif on a henna pattern might make it seem complicated but its not ! This mehndi pattern with swirls and peacock motifs is absolutely appealing and alluring while being on the easy side of drawing it on the hands. The peacock motif in this latest mehndi design is placed at the centre whilst the the bottom the peacock motiff is extended to floral motifs. 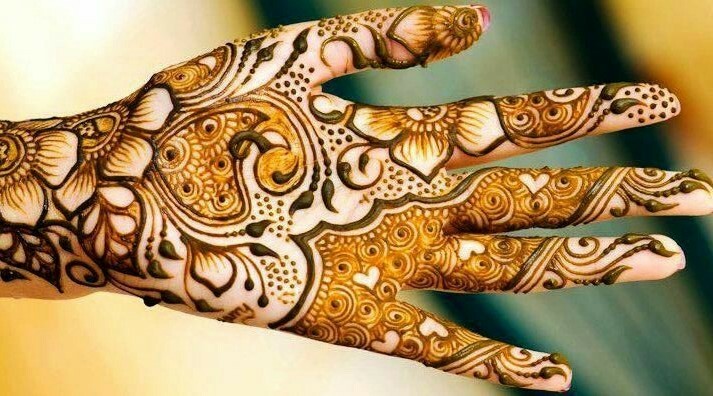 The detailing on the fingers is minute which adds to the beauty of the whole mehndi pattern ! 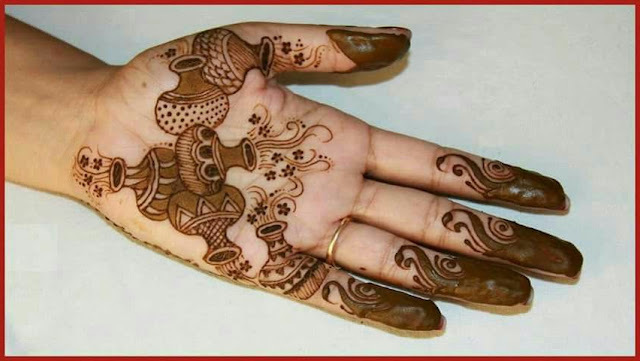 This is the most easiest mehndi design.All you women who are not looking for complex designs must try this latest mehndi design for simpler occasions. This arabic mehndi design looks gorgeous when done with a thin pinned cone. 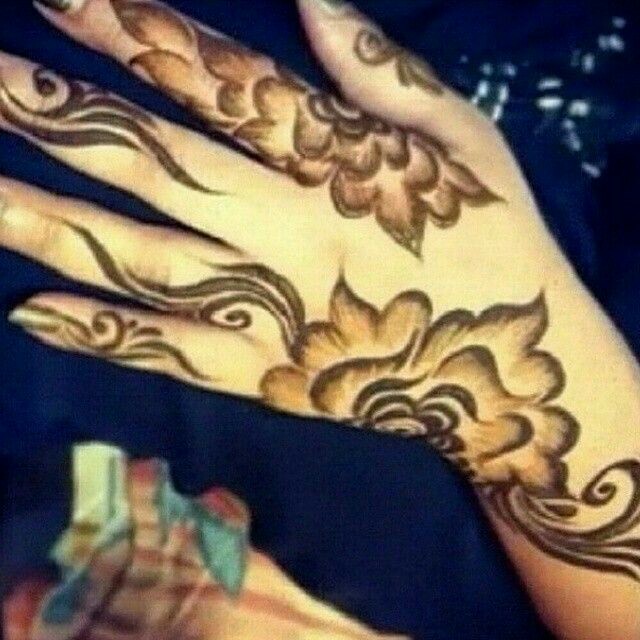 Roses are feminine and make pretty designs for mehndi art. But when done with a little bit of shading on the back of tour hands the end result is FABULOUS ! I love this design so much I am totally going to try this one for EID ! 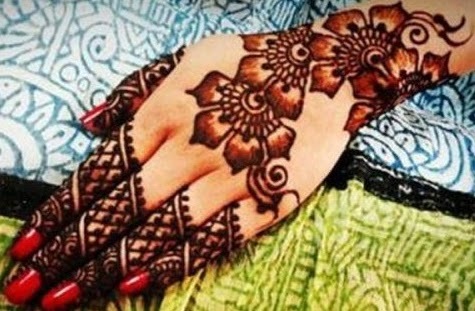 With Ramzan just round the corner this henna pattern is a MUST TRY girls ! 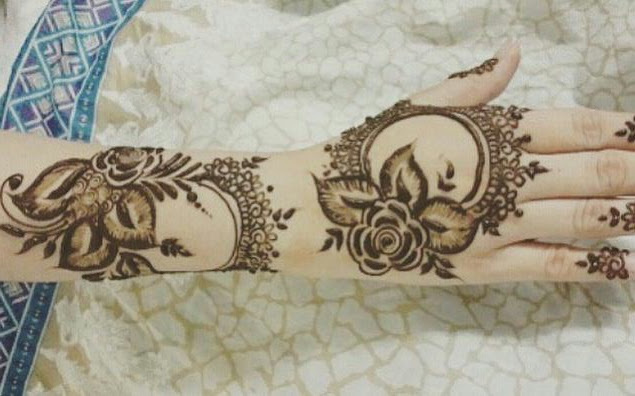 This latest mehndi design with roses and shaded details will be a favorite among girls this Eid season. One of my favorite floral mehndi designs. Flowers and the color red when combined together form to give a beautiful stunning effect ! This might look extravagant but is easier when drawn. This requires a red cone for shading and a normal one for outlining. Jaali patterns cover the finger tips of this latest mehndi design while the floral motiffs have beautiful shaded details with a red colored cone. I am one of those who prefer mehndi art on the back of the hands rather than the front as the visibility of the backside of my hands is more when I am busy and doing a lot of work with my hands. Hence I would choose a latest mehndi design for the back of my hands to stand out. If you also want to enhance the back of your hands and leave your front of the hands plain this is the perfect mehandi design. The uniqueness of this design adds glamour and will make you shine even without having mehndi in the front of your hands ! All of the latest mehndi designs above are sure to up the glam quotient. Which one of these is your favorite? !